LSI Portsmouth Blog: Glittering Prize for G! Boutique - Again! Glittering Prize for G! Boutique - Again! We have written before about the G! Boutique; a 14 bed-roomed boutique hotel that was opened just over 2 years ago by LSI’s previous marketing director Allan Gray and is run by his family. The hotel is a luxurious boutique hotel, right in the heart of Southsea in Festing Road. Since it opened it has been getting a lot of attention; from winning awards to being featured on television and ... they have done it again. 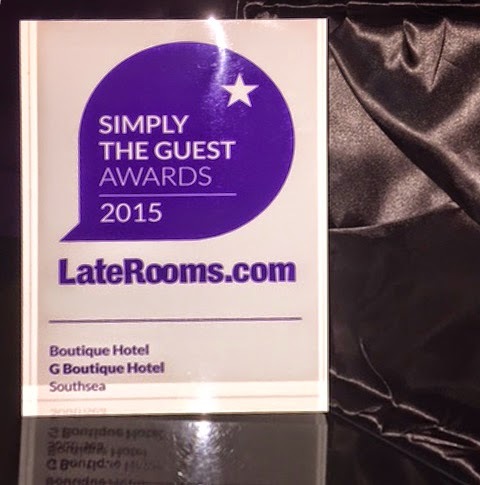 Simply the Guest by LateRooms.com. What makes this award particularly special is that it is voted for by guests. The award announcement was live streamed on the LateRooms.com website from the Savoy in London and was hosted by TV personality Alex Brooker. On the LateRooms.com website, Guests can vote for accommodation in various categories which include customer service, cleanliness, room quality and friendliness among other things. And with over 2 million real reviews left on the site - winning an award really is an accolade! G! Boutique achieved the highest score with 99 per cent of their guests saying they would recommend the hotel to a friend and 98 per cent saying they would stay there again. Clear proof that it really is THE place to stay in Portsmouth, and definitely the hotel we first recommend visitors to stay at when they come to Portsmouth!